A new year is a harbinger of hope. The first step from the old into the new, one would like to walk with a mind freed of the bitter and full of bonhomie. And so even if it was Prime Minister Narendra Modi’s flair for the dramatic, that saw him walk into his Pakistani counterpart Nawaz Sharif’s home, both of them deserve fulsome praise for it. If I could walk into my journalist neighbour Bashir Pathan’s house in Gandhinagar and he into mine without any fanfare, why can’t they. That’s the way it has been in our part of the world. We call across each other’s home so do our womenfolk and children to exchange gossip or plain play. Why should we depart from the customs and camaraderie of our forefathers just because a fence divides us? Brothers do part, sometimes bitterly too when divisions take place but the angst should be a flowing stream not a stinking, stagnant pool. 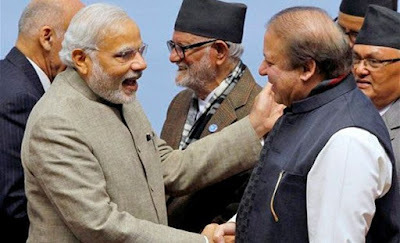 The fact that Modi and Sharif did not discuss Kashmir, reviving cricket ties or the Hurriyat was big news. Why should they always, and incessantly? Why can’t they, for once, talk like good acquaintances if not friends? Of lots that’s common, of friends and family, or just what helps getting to know each other better. Or as the Indian prime minister told his counterpart, “Why can’t we be like leaders in Europe who meet each other for casual get-togethers and chats?” He knows why. What you sow so shall you reap. When in the opposition, he was the answer; now in the chair, his is the question. But more about it some other time. There is lot in common and many benefits for both families (countries) in shared togetherness. So the heart had cause to be happy when Modi ambled across into a house in the throes of mirthful celebrations. As he bowed to touch the feet of Sharif’s elderly mother, I am sure he rose in the esteem of many of the average citizenry in the neighbouring homes as much as he did amongst us likes back home who do so in reverence to our own all the time, very naturally. There is much that is not right with us, our system, our politics and our politicians but when one shows the courage to think out of the box and rise above the mundane, I for one, would like to put all my reservations aside to express my appreciation of my prime minister. Sharif had shown striking spontaneity as he responded to be present for the Indian prime minister’s swearing-in. Modi has added to it with grace, dignity and the customs of his country. One swallow does not a summer make, nor does one gesture wash away the mutual suspicion solidified over decades. An easy amiability between elderly heads of nations, however, does make a difference. The subordinates who bring up the rear become less of stiff-necks and things generally begin to move. It is not that earlier prime ministers have not taken the initiative. The present government would have you believe that nothing happened in the last six decades and that they are the first ones in the history of independent India to pick up a shovel. This is delusional and far from true. All of them did to the best of their respective abilities. Sometimes the situation was not conducive in our own country, other times not so in theirs. It was Atal Bihari Vajpayee who last tried to break ground with his bus-yatra, but alas the effort did not bear the desired fruit for reasons now best known to all. Things happen the way they happen for a variety of reasons. No harm in trying again. The process of peace may be tougher but it is any day cheaper than the cost of war. Death comes only once but the fear of death haunts a lifetime and extracts hundred times the price. Scarce, precious resources are being frittered away in a deadly arms race on both sides, money that could otherwise best serve the people. Additionally, an entire global commerce thrives based purely on the confrontation between the two. Whether it is contraband, clandestine arms and narcotics or plain export-import of terror. Land or sea trade that could ensure cheap and easy movement of commodities find circuitous ways of travel causing time and cost overruns. Or again, the plain business of opposing each other is painfully costly. Neither country gains, others do. Sharif hit the nail on the head when he said that there were constituencies opposed to the peace process, and this process needed to be insulated from such forces. While he has his hands full dealing with loads of them on his own terrain, Modi’s problems are more intricate. Sample the headlines in and around the same time. In Delhi BJP general secretary Ram Madhav is quoted in an interview to Al Jazeera TV reiterating the traditional RSS line that India, Pakistan and Bangladesh could re-unite through popular goodwill to form ‘Akhand Bharat’, adding “as an RSS member I also hold on to this view”. Same day in Mumbai, Modi’s minister Giriraj Singh is quoted saying “that the time has come to redefine minority and called for curbing uncontrolled growth of population through a uniform policy for Indians”. Why does a minister of state for micro, small and medium enterprises out to review the progress of projects undertaken by his ministry need to stray into alien territory? Babies and population is not his mandated responsibility. Knowing Modi as this reporter does, having spent a fair share of his journalistic career covering him, one would deign to say that the worthies in question would not be able to open their mouth – out of turn – in his presence. The capacity of the likes of such people to do good may be limited but their ability to throw a spanner in the works of their leader is immense. One is inclined to believe that at least a fair share of Modi’s problems would stand solved if he slaps a silencer on the motor-mouths within his own larger party. By the way, many of their ilk wanted Amir Khan, Shahrukh Khan, Salman Khan or many other ‘khans’ and ‘pathans’ to go to Pakistan. See who actually went? And how? Silence is sagacious. The past is already a blur. A new dawn beckons. With hope. Amen, Ameen, Tatasthu!